Check out our new products! 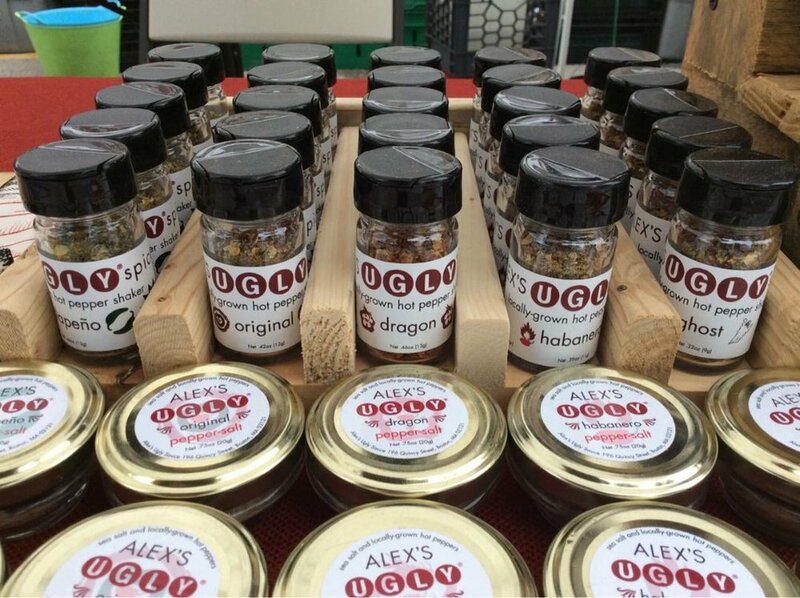 Our Bloody Mary mix, dried pepper blends, and Cooking Sauce are all available at our Farmers' Markets. A better version of the classic Bloody Mary mix using tomatoes grown by Massachusetts farms, vegetarian Worcestershire sauce made in Brockton, horseradish produced in Watertown, and of course Alex's Ugly Sauce, made right here in Boston using Massachusetts grown peppers and New England honey. Tasty enough to drink straight, and an amazing cocktail when combined with the adult additive of your choice! Nothing but the peppers! We took the same Massachusetts grown peppers we use for Alex's Ugly Sauce, dried them in-house and ground them ourselves to bring you the heat, the whole heat, and nothing but the heat. Available in: Jalapeno, Original, Dragon, Habanero, and Ghost. Massachusetts grown peppers and sun-evaporated sea salt and that's it! The same amazing peppers we use in Alex's Ugly Sauce, ground super-fine and mixed with just the right amount of salt to bring a truly unique addition to your table. The one you’ll reach for! Our savory cooking sauce is the perfect addition to any dish. We made this all-purpose sauce with just a hint of heat to really open up the flavors of your meal. Get ready to discover your new go-to ingredient! How do I use it? The possibilities are endless. Try it in your marinade, saute, stir fry, salad dressing, or as a brush-on grill sauce. Mix 1/2 cup Alex's Ugly Cooking Sauce, 1/2 cup olive oil, 2 Tbsp Worcestershire sauce, and 1/2 tsp salt. Marinate your chicken, steak, pork chops, or veggies and chill for at least an hour. It’s supposed to look that way! We make our salad dressing the same way we make all of our products: using only the best real-food ingredients like fresh red bell peppers and locally-harvested honey. Our unique recipe brings you a bright, tasty dressing with just the right balance of zing and sweetness. We never use any artificial colors or preservatives, or any gums or emulsifiers, so it separates after a little while (just like the salad dressing you make at home). Shake it up, and enjoy the Ugly! How do I use it? The obvious answer is on your salad, but there are so many more ways to enjoy the newest addition to the Alex’s Ugly Sauce line! Add a different zing to your marinade, pour it on everything that hits your grill, or even use it as a sauce on its own (it is surprisingly tasty on rice! ).